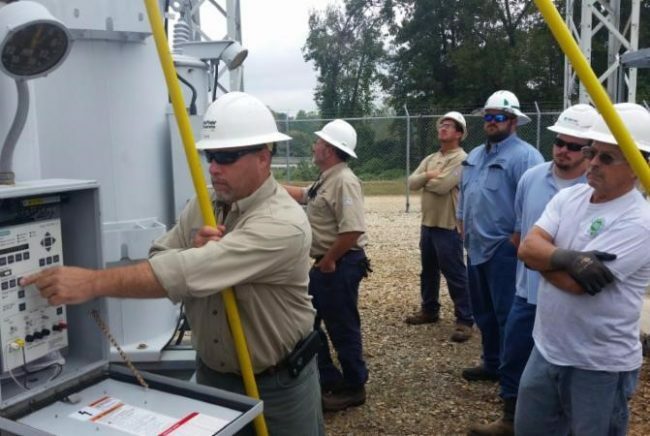 Last month, the statewide Job Training & Safety (JT&S) team facilitated Substation School at North Carolina’s Electric Cooperatives’ training facility at Nash Community College in Rocky Mount. Twenty-nine students from 13 electric cooperatives attended the session. The training concentrated on employee responsibilities in a substation by instructing the students on substation design considerations, fall protection, grounding, operating and bypassing reclosers, operating and bypassing regulators, hooking up a mobile substation, and substation safety.